once all the sale items are collected, sorted and priced, volunteers transport them on luggage trolleys. A frenzied crowd moves excitedly from room to room searching for the best deals: A dress, a handbag, maybe a pair of designer shoes in just the right size. It is a party like no other on the island. If you live in the Turks and Caicos, you know that residents look forward to the second Saturday in October. It’s when they put on their favorite pink outfits and enjoy a night at The Palms resort. 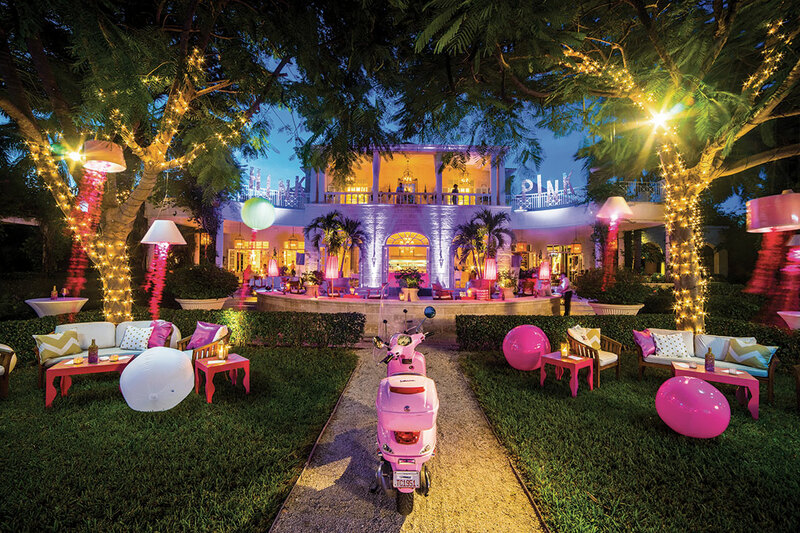 The event – known as In The Pink – has been drawing record crowds since 2009. 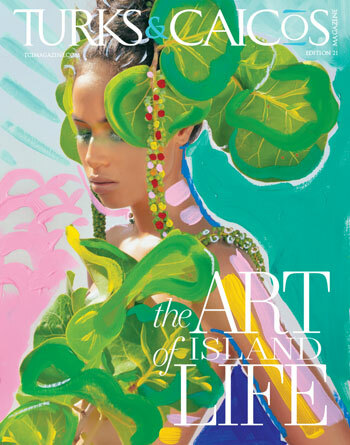 As its popularity grows, so does the positive influence it provides to islanders living with cancer. 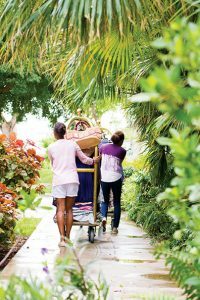 The elaborate social event began with a simple idea: Resell new and slightly worn clothing donations to raise money for the National Cancer Society of TCI (NCS). Over the past nine years the event has blossomed into the Society’s largest fundraiser, attracting a diverse cross-section of the community to support a cause that hits close to home for many of the participants. Since that first In The Pink, the event has continuously evolved. But one thing that hasn’t changed is the core group of women who dedicate their time to making In The Pink one of the island’s biggest nights of the year. “It’s quite substantial because it helps us to continue to support our patients,” said current NCS President Rosemary Jolly. It started with a brainstorming session between former NCS President Lucille Lightbourne and Karen Whitt, who was the general manager at The Somerset resort at the time. The result was a fashion extravaganza that now covers two condos on two floors, plus the pink-bedecked ballroom and courtyard at The Palms. For that first event, Whitt enlisted the help of the few volunteers who still make up the core group of room hostesses. They held the first sale in a five-bedroom penthouse at The Somerset, with a small “pink party” in the living room. The first event “was basically just a shopping frenzy,” Whitt said. There were cocktails and nibbles in the suite, and hundreds of different items of clothing and accessories for sale. But it also served its second purpose: raising awareness. Since the first In The Pink in 2009, the event has certainly evolved. But one thing that hasn’t changed, is the commitment of the team of volunteers who dedicate their time to making In The Pink one of the island’s biggest nights of the year. In year three, they added a pre-event cocktail party. In year four, the pre-party morphed into an after-party on the lower pool deck of The Palms. Then Casablanca Casino offered to host a pink poker tournament. Someone suggested offering VIP tickets for early entrance to the shopping floors. Fashionistas gobbled them up. And still the community support grows. Women save their clothes all year to donate. Local businesses offer items. Teams of women spend weeks planning, collecting donations and preparing the clothes for sale – a process that includes sorting, steaming and tagging. 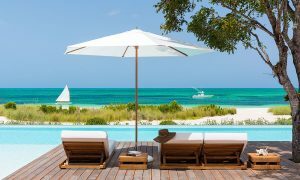 But when twin hurricanes affected the Turks & Caicos last fall, residents worried that In The Pink might be one of the casualties. The usual October date was obviously no longer practical. The team could have cancelled rather than risk rescheduling. Besides, with all the disruption, would people even have donations to offer? Despite some organizer anxieties, the event was set for Saturday Nov. 18. Women, and men, waited in impressively long queues to pay for their found bargains. Participation in the poker tournament was at its highest to date. The Palms courtyard was alive with people toasting and dancing the night away. Whitt declared it the largest crowd in the event’s history. For the first time, the funds were split in 2017 between two causes. 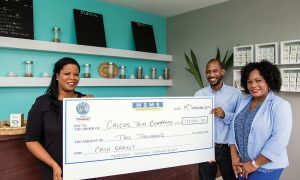 The NCS received a welcome donation, which supports its warm-hearted efforts to lessen the burdens of those in the community suffering from cancer as well as their families. But this year’s benefactors also included government primary school students across the islands, who personally and whose schools were significantly impacted by the two September hurricanes. Each one received a gift.